Google Chrome has been updated to version 41, which includes support for native emoji on the Mac for the first time. Often considered a front-runner for new web standards and technologies, Chrome's lack of emoji support has long frustrated users by showing empty squares; unable to render the color emoji characters supported by other browsers. Apple added emoji support to OS X in 2010 with the release of OS X 10.7 Lion, which coincided with the introduction of Unicode 6.0. 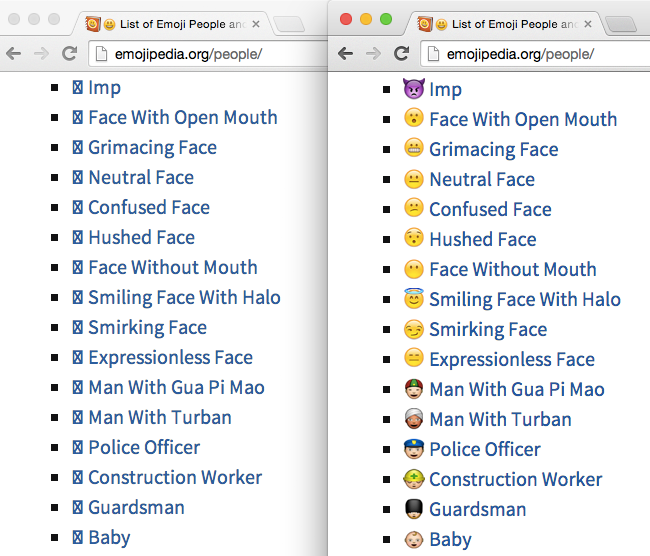 This was the first release of the Unicode Standard that included emoji, paving the way for cross platform emoji support now prevalent across iOS, Android, Windows and OS X.
October 2011 was when Chrome's inability to display emoji was first filed with the simple title; Emoji does not display in webpage contents on OS X Lion. In January of 2012, a similar bug was reported for Firefox (Add color emoji support to Gecko) and resolved by the end of 2012. Twitter created their own emoji implementation in April of 2014, which replaces native emoji characters with Twitter's custom-designed images. These are shown to all users of the Twitter website, as well as the Twitter-owned TweetDeck. With the introduction of Chrome 41 for Mac, every major Mac browser now supports emoji: Safari, Firefox, and Chrome. Chrome users can now view the list of emojis by category, without requiring the use of extensions, or switching to an alternative browser. The Windows version of Chrome does not yet support color emoji, but is able to display emojis from the black and white Segoe UI Symbol font on Windows 7 and above.